Bertrand Piccard is the son of the famous Rolex explorer Jacques Piccard who set the all-time depth-record of 7 miles down in a U.S. Navy Submersible, 50 years ago, with a Rolex DEEP-SEA special prototype attached to the outside. Jacques Piccard's father who is Bertrand's grandfather was also a record setting explorer and you can learn everything about them in two articles I wrote. The first article covers the life of his father, Jacques Piccard, and the second article covers The 50th Anniversary Of The Deepest DEEP-SEA Dive in History. 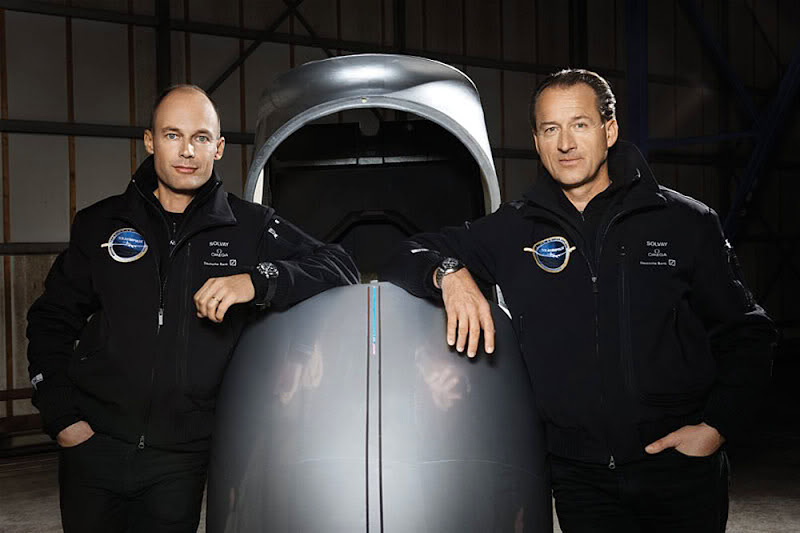 Bertrand Piccard is pictured above on the left side, and his career achievements as an explorer are second to none. Among other incredible achievements, he was the first person to successfully fly around the entire planet in a balloon. His latest project is named Solar Impulse which is very ambitiously attempting to fly a prototype solar-powered airplane around the planet!!! 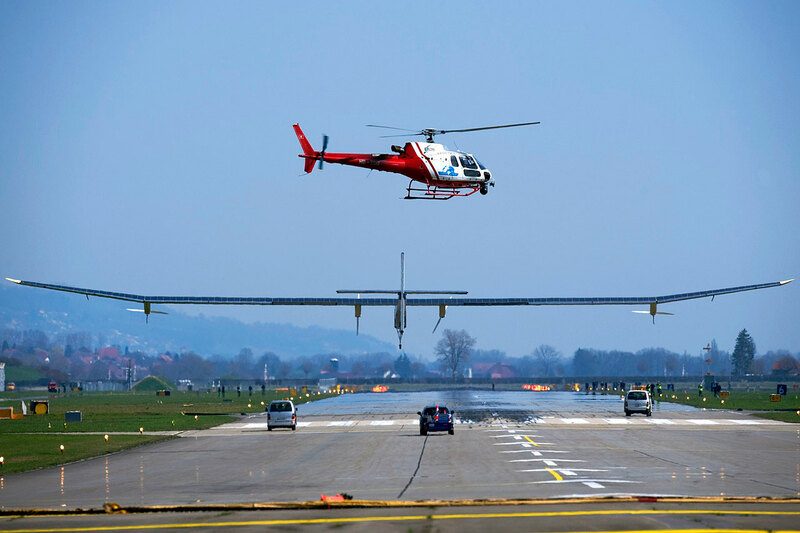 The Solar Impulse airplane uses only solar power and today he flew it successfully in the Swiss Countryside on its maiden voyage. 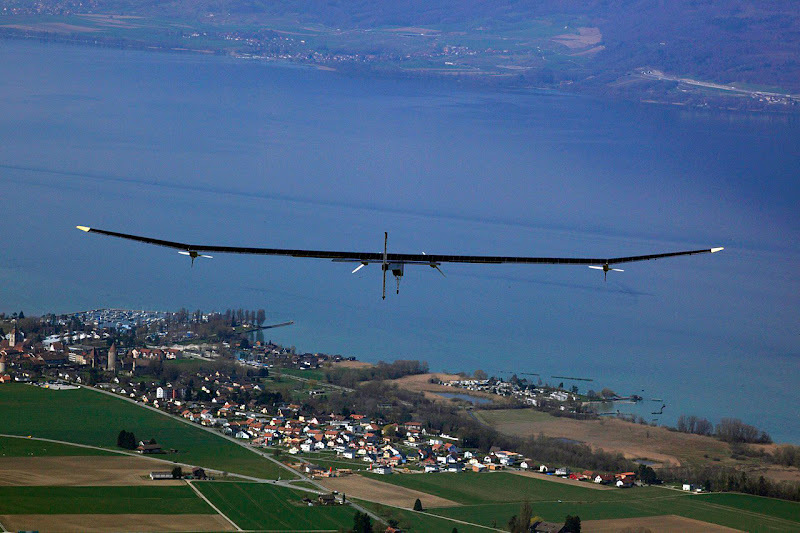 The photo below shows the Solar Impulse above the skies of Switzerland. The Solar Impulse is powered by 12,000 solar cells and he successfully flew it for 87 minutes and took it all the way up to 4,000 feet. The Omega watch company of Switzerland is a sponsor of the project and even developed a really cool chronograph model to commemorate the Solar Impulse. We will examine the watch model later in the story. Bertrand Piccard said "The first mission was the most risky phase of the entire project." 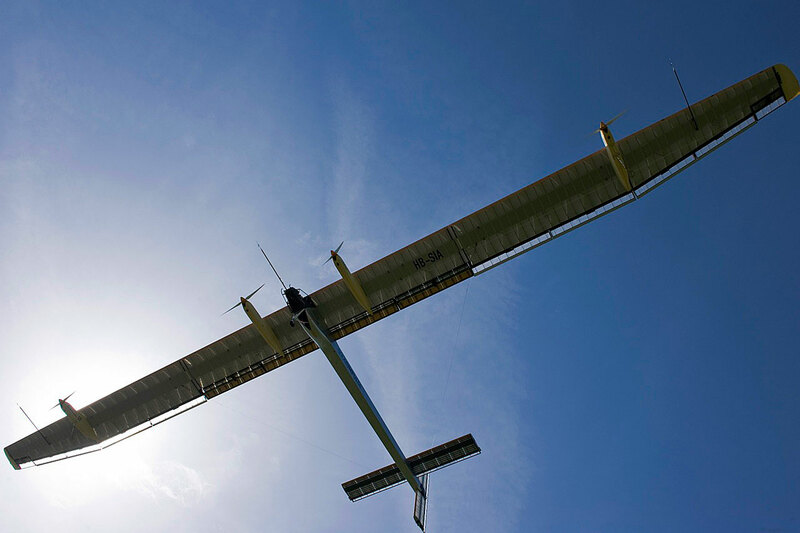 It took 7 years of research and development to build the revolutionary solar powered prototype airplane. The Solar Impulse airplane is known as The HB-SIA and it set another record for being the larges and lightest airplane to ever fly. It is so large, in fact, that its wingspan is equal to a jumbo jet!!! It is actually has a wingspan of 208 feet which is more than 10 feet wider than a Boing 787!!! 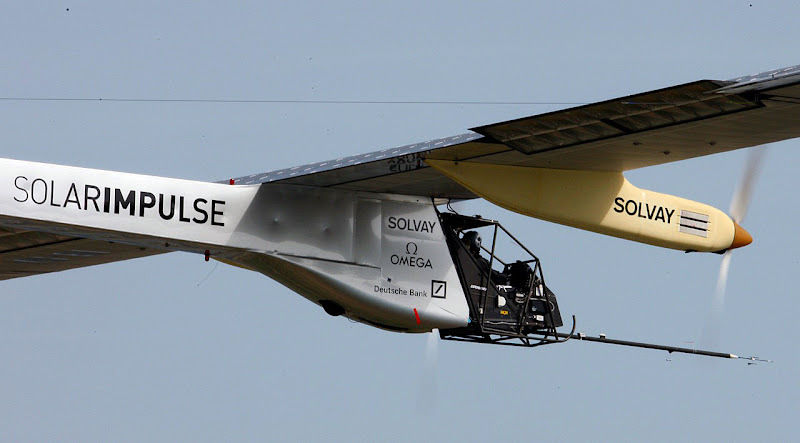 The irony is that a typical jumbo jet, like an Airbus 380 weights 560 Tons, The Solar Impulse HB-SIA conversely only weighs 2 Tons, which is as much as a small car!!! The HB-SIA achieved lift-off at less than 30 Miles Per Hour based upon its four, 10 Horsepower electric motors. In the illustration below we see the Solar Impulse HB-SIA compared to an Airbus 380. 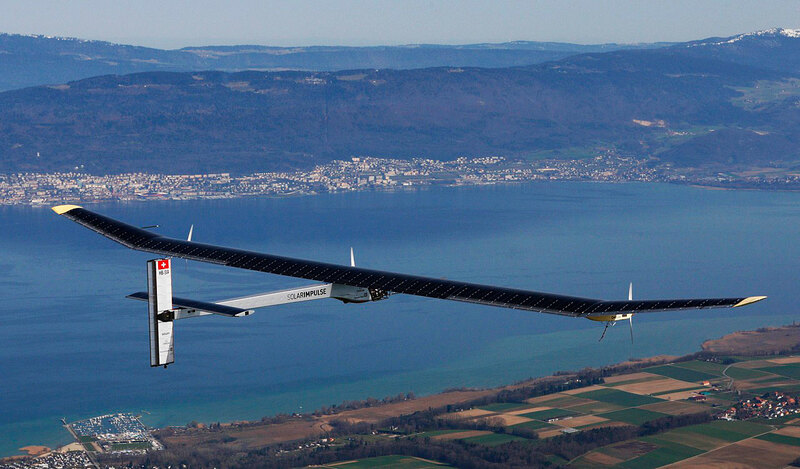 The long term-plan is to fly the Solar Impulse around the entire globe without stopping and the ambitions timeframe calls for achieving this in 2012!!! Omega is a sponsor of the Solar Impulse project and they developed this special Solar Impulse HB-SIA chronograph to commemorate this amazing project. 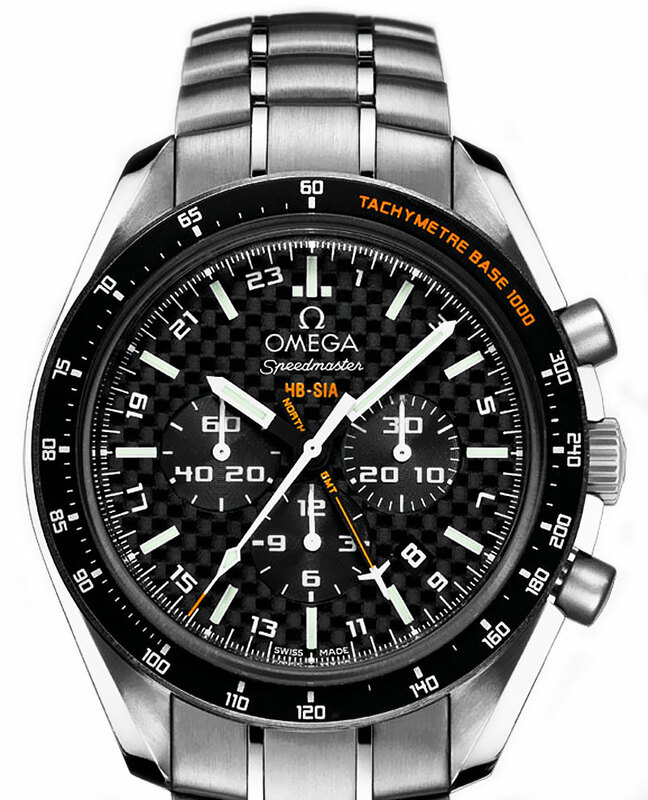 It kind of looks like a modernized Omega Moonwatch and I like the orange detail which also gives it a retro look. 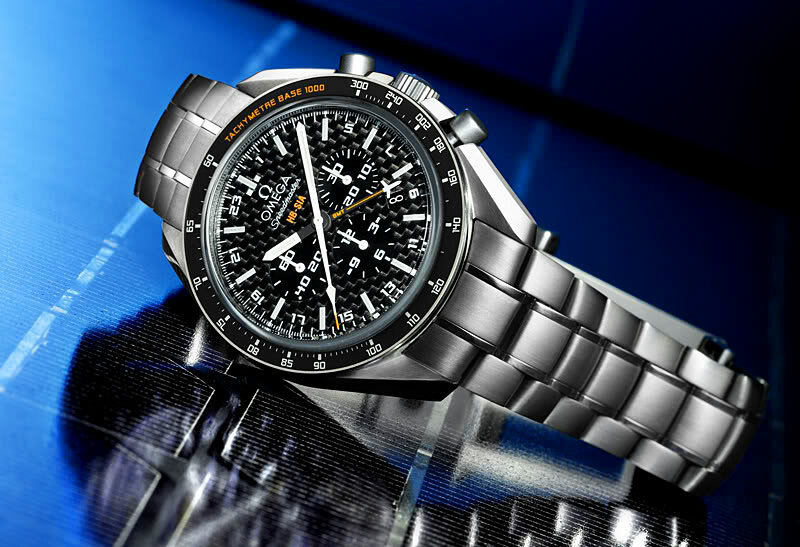 The watch case and bracelet are titanium and the dial is made from carbon fiber. The watch features an exclusive Omega Calibre 3606 whose revolutionary Co-axial Escapement and free sprung balance deliver long-term stable reliability and accuracy and it is a COSC Certified Chronometer. 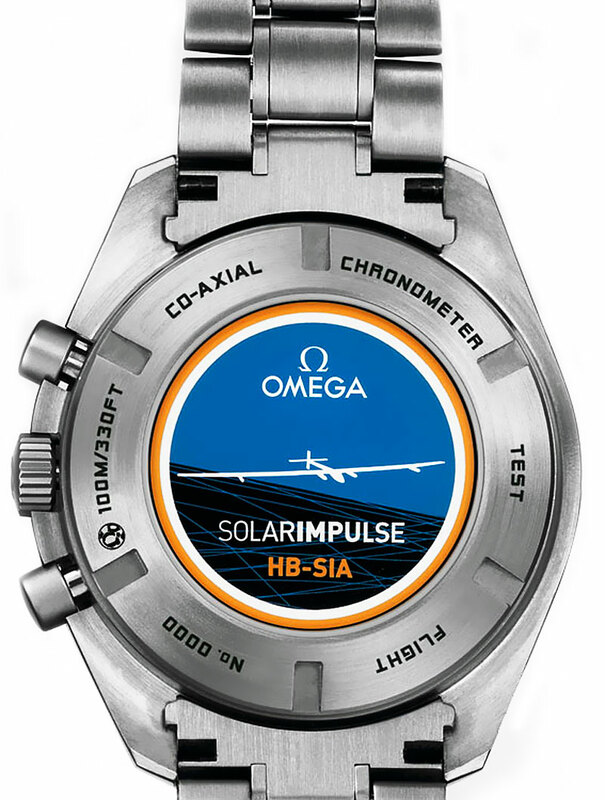 On the back of the watch we see the Solar Impulse HB-SIA designation with a graphic of the airplane and notice each case is individually numbered. It also has the Swiss Chronometer designation on the back. Very cool looking watch and an amazingly cool and innovative project. Omega has participated as one of the main partners in the project because they believe the planet is in urgent need to develop safe, sustainable energy sources. This video is from the first time they tested the Solar Impulse on what is known as a Flee-Hop where they just fly it a few feet above the ground to make certain it is air-worthy. In this next video we hear from Bertrand Piccard and we see his father, Jacques Piccard hugging him after he successfully completed his record-setting balloon flight around the globe. One of my favorite features on Jake's Rolex World is I always attempt to bring the people I tell stories about, to life, and that is exactly what we achieve with this great video interview. Bertrand Piccard is not only an amazing explorer and scientist, but an equally amazing human being!!! Enjoy!! !